shopnewbalance.com: Baby, it's Cold Outside! As winter approaches and the temperature drops, it's time to start thinking about your winter wardrobe. 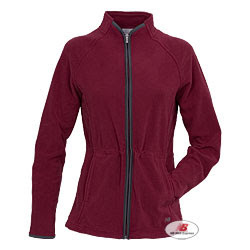 To keep cozy during the big chill, New Balance has a new line of women's comfy fleece to keep you warm. The Anorack Fleece (pictured to the left) is lightweight and designed with warm microfleece fabric. The side hand pockets will warm your chilly hands and keep your keys safe at the same time. In the winter, I live in New Balance fleece, but you could also wear this on a fall day or on chilly morning walks. The updated Fleece Half-Zip Jacket is cozy and versatile enough to wear with jeans or during a cool morning workout. The contrast binding at the neck gives great detail and makes this top stylish. So, whether you are looking for early gift ideas for the holidays or looking for a cozy top for the winter, try on this new line of New Balance fleece.